We now live in an age were we expect more information then ever. Online, interactive and instant. We have gone in a pretty sort space of time from being used to idling time away at bus stops with the bus to be along sometime in the next half hour or even hour if you live out side a city or big town, to not wanting to wait more then 15 minutes. This is changing, it’s not been that way in many countries in Europe for the decades and it seems that we have always been behind the curve. I don’t think we will ever get to the same efficiently as the German or Japanese transport systems, esp when trains arriving into Dublin city train stations can be 10 – 15 minutes late and still considered to be ‘on time’. It’s also crazy that you can’t book a train ticket for more then 4 weeks in advance on intercity routes. But for many people in Dublin it is Dublin bus which they use the most grudgingly, most people will if they can get the Dart, train or luas rather then get the bus, paying more and working their day around less frequent departure rather the suffer the bus. There has also been the rise of private bus routes for those who live in some of the gather suburbs and again people will prefer to get a bus which takes a more direct route then sit on a bus which goes too far out of their way. One way to try and combat this is I guess it to give people what they have wanted, which is to know when their bus is due. The next bus to the stop they are at, for the route they want. Sounds pretty simple doesn’t it? and such systems are in place in other cities but just not here. 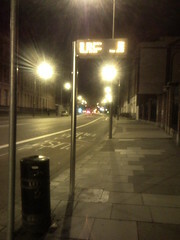 Well the signs are slowly being rolled out, they all having still in testing on them but they seem to work. I know that if I am having to wait at a bus stop in a quiet area at night alone, it’s reassuring to know when the bus is going to get there, and that even if the next bus due at the stop is not the route I want there will be a bus passing where I am soon. Information doesn’t just inform it connects people and the more information and connection we have to others the less alone and vulnerable we feel. Previous PostLike buses.Next PostRape Culture in advertising?